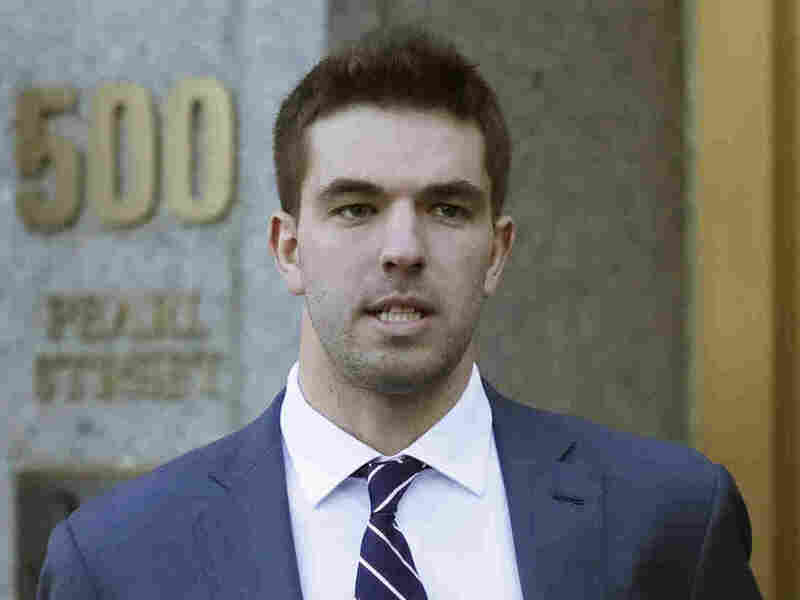 Fyre Festival Promoter Billy McFarland Pleads Guilty To Fraud : The Two-Way The man behind a promised luxury music event in the Bahamas admits defrauding investors and faces federal prison time as well as many civil lawsuits. Billy McFarland, promoter of the failed Fyre Festival in the Bahamas, pleaded guilty to wire fraud charges in New York. Concert promoter Billy McFarland, who promised to stage a "life-changing" Caribbean music festival in the Bahamas last year and instead presided over a fiasco, pleaded guilty to two counts of wire fraud and faces up to a decade behind bars. A contrite McFarland admitted in a Manhattan federal court that he had defrauded 80 investors and falsified documents to secure more funds to put on the 2017 Fyre Festival. "I deeply regret my actions, and I apologize to my investors, team, family and supporters who I let down," he said as quoted by The Associated Press. The two counts of wire fraud each carry a maximum of 20 years in prison. But under the plea agreement, McFarland likely would face a sentence of eight to 10 years and a fine of up to $300,000. The Fyre Festival was promoted as a two-weekend event on the island of Great Exuma with an opportunity to see big name acts, live in luxury accommodations and eat gourmet food. Instead, customers expecting to see Blink-182 and the hip-hop group Migos arrived on the island to learn that some acts were canceled and that they would be lodging in leaky tents and served cheese sandwiches. The reaction by angry concertgoers on social media turned the event into an embarrassing failure. McFarland, whose concert scheme grew out of a digital application for event promotion, admitted in court that he was out of his league. "I grossly underestimated the resources that would be necessary to hold an event of this magnitude. In an attempt to raise what I thought were needed funds, I lied to investors about various aspects of Fyre Media and my personal finances. Those lies included false documents and information," he told U.S. District Judge Naomi Rice Buchwald. McFarland also pleaded guilty to lying to an unnamed ticket broker to persuade him to buy $2 million for a block of advance tickets to Fyre festivals that would be staged in the future. "In addition to prison time, McFarland and Fyre Media face more than a dozen civil suits and an ongoing bankruptcy liquidation of the company, as investors and ticket buyers try to recover some of their losses," Bloomberg reports. McFarland's sentencing is scheduled for June 21. A previous version of this story incorrectly identified the band Blink-182 as Blink-22. In addition, Great Exuma was misspelled as Great Exhuma.